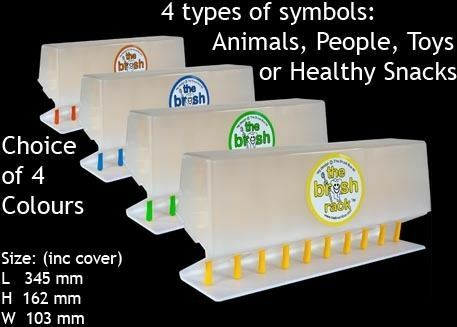 This toothbrush storage system uses toothbrush stickers with symbols (included) to identify each child's toothbrush. These match symbols printed on the Rack. Each Rack holds 10 toothbrushes and there is also space to write each child's name on the Rack. Each rack comes complete with a cover included in the purchase. The Rack is specially manufactured to accept the types of toothbrushes that we sell. Some other makes of toothbrush may not fit ! Racks are designed to be used free-standing or wall mounted using the mounting brackets moulded into the design.